The potential of behavioural approaches for improving the lives of people with acquired brain injury is immense. Here that potential is laid out and explored with a thoroughgoing regard for clinical practice and the theoretical frameworks that underpin that practice. This book will prove an invaluable resource for clinical psychologists and the whole range of therapists working with patients suffering from acquired brain damage. A Brief History of Behavioural Approaches in Neuropsychological Rehabilitation. 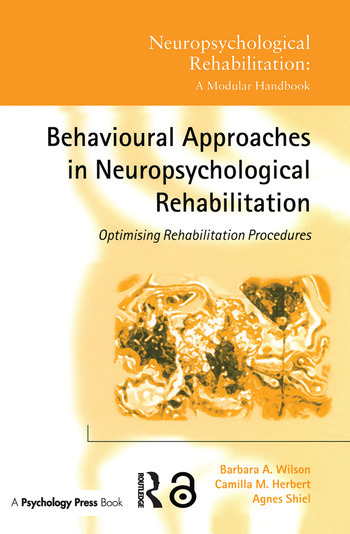 Assessment for Rehabilitation: Integrating Information from Neuropsychological and Behavioural Assessment. Planning a Rehabilitation Programme. Using a Behavioural Framework. Behavioural Approaches to Assessment and Management of People in States of Impaired Consciousness. Behavioural Approaches to the Remediation of Cognitive Deficits. Behavioural Approaches to Disruptive Disorders. Behavioural Approaches to Cooperation with Treatment: The Effects of Mood, Insight and Motivation. Educating Staff and Family Members in the Long Term Management of Behavioural Disorders.